NHS England and leading clinicians/burns specialists have published first aid guidance and information about treatment following an acid attack. 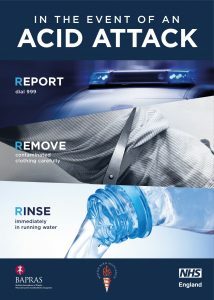 Acid attacks can lead to lasting injuries. Acting quickly and carefully to Report, Remove and Rinse can help reduce the impact for victims. The Phoenix Society for burn survivors is a non profit organisation in the USA dedicated to empowering those with a burn injury. Their website includes a resource library with an extensive collection of articles, stories and information from industry experts on various topics that affect those living with a burn injury. The topics address many of the questions burn survivors are looking for answers to. Browse Phoenix Society Resource Library. If you are unable to find the answer or information you are looking for, please get in touch with us contact. The charity Changing Faces have a number of self-help guides available online. Their self-help guides for adults are aimed to help those living with a different appearance learn techniques to handle various situations including handling other people’s reactions, communicating and living with confidence, intimacy, love and relationships. The Centre for Appearance Research (CAR) have a number of podcasts to do with appearance and visible difference.